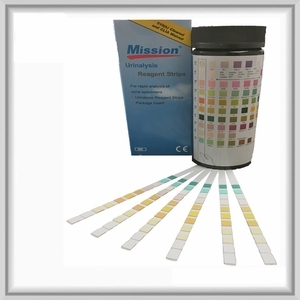 Easy-to-use urinalysis strips: Dip and read - no additional instruments needed! Collect a fresh urine sample in a clean, dry container preferably glass. First morning samples contain the highest concentration of target markers. Remove one reagent strip from the bottle and immediately replace the container cap, minimizing the exposure of the remaining test strips to light and air. Discuss with your physician or healthcare provider and then discard the used reagent strip. Each container of urinalysis reagent strips includes a color coded chart. The reactive color of each panel on the test strip is compared to the closest corresponding color on the result chart. The concentration level range for each chemical marker is indicated below each color block on the result chart. As with all tests dealing with color intensity or color matching, it is often recommended to obtain another person's interpretation of the test result. Ketones: This test reacts with acetoacetic acid in urine. It does not react with acetone or b‑hydroxybutyric acid. Some high specific gravity/low pH urines may give reactions up to and including 'Trace'. Normal urine specimens usually yield negative results with this reagent. False positive results (trace or less) may occur with high pigmented urine specimens or those containing large amounts of levodopa metabolites. Ketone bodies such as acetoacetic acid, beta-hydroxybutyric acid, and acetone can appear in urine in small amounts. These intermediate by-products are associated with the breakdown of fat. Causes: diabetes mellitus, starvation, diarrhea. Blood: The significance of the 'Trace' reaction may vary among patients, and clinical judgment is required for assessment in an individual case. Development of green spots (intact erythrocytes) or a green color (free hemoglobin / myoglobin) on the reagent area within 60 seconds indicates the need for further investigation. Blood is often found in the urine of menstruating females. This test is highly sensitive to hemoglobin and thus compliments the microscopic examination. This test is equally sensitive to myoglobin as to hemoglobin. The sensitivity of this test may be reduced in urines with high specific gravity. Captopril may cause decreased reactivity. False positives reactions can be caused by certain oxidizing contaminants such as hypochlorite ‑ microbial peroxiclase associated with urinary 'tract infection may also give a false positive reaction. Levels of ascorbic acid normally found in urine do not interfere with this test. Hemoglobinuria is the presence of hemoglobin in the urine. Causes: hemolytic anemia, blood transfusion reactions, massive bums, renal disease Hematuria is the presence of intact erythrocytes. Almost always pathological. Causes: kidney stones, tumors, glomerulonephritis, physical trauma, urinary tract infection, Prostatitis. pH: The pH test area measures pH values generally within 1 unit in the range of 5 8.5 visually and 5 9 instrumentally with 5 being very acidic and 8.5 being highly alkaline. Generally, urine pH results range from 5.5 - 7.5 in a bell curve type statistical distribution. Average for normal human urine is slightly acidic 6.0, however deviations from normal in any given sample are unremarkable and consistent, repeated readings are required in the top or bottom range to suggest an abnormality. High protein diets increase acidity. Vegetarian diets increase alkalinity. Bacterial infections also increase alkalinity producing a urine pH in the higher 7-8 range. Protein: The reagent area is more sensitive to albumin than to globulins, hemoglobin, and mucoprotein. a 'Negative' result does not rule out the presence of other proteins. Normally no protein is detectable in urine by conventional methods, although a minute amount is excreted by the normal kidney. A color matching any block greater than 'Trace' indicates significant proteinuria. For urine of high specific gravity, the test area may most closely match the 'Trace' color block even though only normal concentrations of protein are present. Clinical judgment is needed to evaluate the significance of 'Trace' results. False positive results may be obtained with highly alkaline urines. Albumin is normally too large to pass through glomerulus tissue. Therefore elevated results Indicate abnormal increased permeability of the glomerulus membrane. Non-pathological causes are: pregnancy, physical exertion, increased protein consumption. Pathological causes are: glomerulonephritis bacterial toxins, chemical poisons. Nitrate: This test depends upon the conversion of nitrate (derived from the diet) to nitrite by the action of principally gram negative bacteria in the urine. The test is specific for nitrite and will not react with any other substance normally excreted in urine. Pink spots or pink edges should not be interpreted as a positive result. Any degree of uniform pink color development should be interpreted as a positive nitrite test suggesting the presence of 100000 or more organisms per ml, but color development is not proportional to the number of bacteria present. A negative result does not in itself prove that there is no significant bacteriuria. Negatives may occur when urinary tract infections are caused by organism which do not contain reductase to convert nitrate to nitrite; when urine has not been retained in the bladder long enough (4 hours or more) for reduction of nitrate to occur; or when dietary nitrate is absent, even if organisms containing reductase are present and the bladder incubation is ample. Sensitivity of the nitrite test is reduced for urines with a high specific gravity. High abnormal readings indicate the presence of bacteria. Causes: urinary tract infection. Leucocytes: Normal urine specimens generally yield negative results; positive results of small (+) or greater are clinically significant. Individually observed 'Trace' results may be of questionable clinical significance; however, 'Trace' results observed repeatedly may be clinically significant. 'Positive' results may occasionally be found with random specimens from females due to contamination of the specimen by vaginal discharge. Elevated glucose concentrations or high specific gravity may cause decreased test results. The presence of leukocytes in urine is referred to as pyuria (pus in the urine). Primary cause: urinary tract infection, Prostatitis..
Urobilinogen This test area will detect urobilinogen in concentrations as low as 3 mIU/L in urine. The reagent area may react with substances known to interfere with Ehrlich's reagent, such as p‑aminosalicylic acid and sulphonamides. Atypical color reactions may be obtained in the presence of high concentrations of p‑aminobenzoic. False negative results may be obtained if formalin is present. Highly colored substances, such as azo dyes and riboflavin may mask color development on the reagent area. Strip reactivity increases with temperature; the optimum temperature is 22‑26 degrees centigrade. The absence of urobilinogen cannot be determined with this test. Bile pigment derived from breakdown of hemoglobin. The majority of this substance is excreted in the stool, but small amounts are reabsorbed into the blood from the intestines and then excreted into the urine. Causes: hemolytic anemia, liver diseases. Specific Gravity: The specific gravity test permits the determination of urine specific gravity between 1.000 and 1.030. In general, it correlates within 0.005 with values obtained with the refractive index method. For increased accuracy, 0.005 maybe added to readings from urine with pH equal to or greater than 6.5. Elevated specific gravity readings may be obtained in the presence of moderate quantities (1‑7.5 g/L) of protein. The specific gravity of urine is a measurement of the density of urine; the relative proportions of dissolved solids in relationship to the total volume of the specimen. It reflects how concentrated or diluted a sample may be. Water has a specific gravity of 1.000. Urine will always have a value greater than 1.000 depending upon the amount of dissolved substances (salts, minerals, etc.) that may be present. Very dilute urine has a low specific gravity value and very concentrated urine has a high value. Specific gravity measures the ability of the kidneys to concentrate or dilute urine depending on fluctuating conditions. Normal range 1.005 - 1.030, average range 1.010 - 1.025. Low specific gravity is associated with conditions like diabetes insipidus, excessive water intake, diuretic use or chronic renal failure. Bilirubin: Normally no bilirubin is detected in urine by even the most sensitive methods. Even trace amounts of bilirubin are sufficiently abnormal to require further investigation. Atypical result colors may indicate bile pigment abnormalities and the urine specimen should be tested further by more quantitative laboratory means. Metabolites of drugs which give a color at low pH, such as Pyridium and Serenium may cause false positives. Ascorbic acid concentrations of 1.42 mIU/L or greater may cause false positives. Bilirubin comes from the breakdown of hemoglobin in red blood cells. The globin portion of hemoglobin is split off and the heme groups of hemoglobin are converted into the pigment bilirubin. Bilirubin is secreted in blood and carried to the liver where it is conjugated with glucuronic acid. Some is secreted in blood and some is excreted in the bile as bile pigments into the small intestines. Causes: liver disorders, cirrhosis, hepatitis, obstruction of bile duct.